Product prices and availability are accurate as of 2019-04-03 06:31:32 EDT and are subject to change. Any price and availability information displayed on http://www.amazon.com/ at the time of purchase will apply to the purchase of this product. 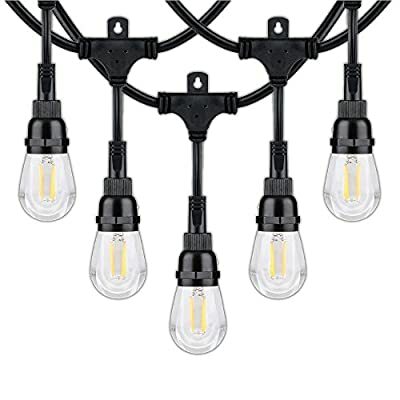 The Honeywell 36' Commercial Grade LED String Lights are the perfect addition to any indoor or outdoor space. With each string, 18 vintage style filament bulbs deliver a soft amber light that is sure to enhance any patio, deck, fence, backyard, gazebo, pergola, dining area, party, wedding or camp site. Up to 15 strings (36 feet per string) can be connected together, creating 540 feet of light. The LED bulbs are replaceable and are backed by a 5-year manufacturer's warranty. 431.89" x 1.69" x 4.49"